Experience Vermont from the Birch Ridge Inn! Favorite Bike Tours : The Salt Ash Loop. The name of this tour is the Salt Ash bike tour, as the tour spends much of it's time in Plymouth Vermont, which was originally named the town of Saltash. In addition, the tour has one steep hill climb, up Salt Ash Hill. 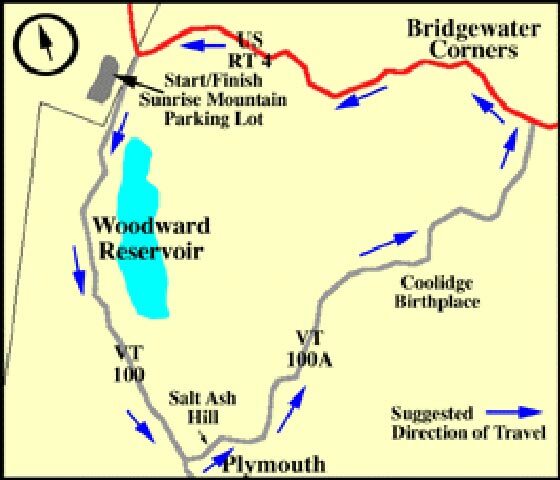 The 18 mile bike loop follows a triangular course starting and ending at the parking lot of Killington's Sunrise Mountain, located at the junction of US Rt. 4 and VT Rt. 100. Start by traveling south down Rt. 100. The road will initially start out straight and level, but will quickly change to a gradual uphill incline with many twists and turns. Near the top of the incline you will pass the Woodward reservoir, off to your left. Woodward reservoir is a quiet lake known for it's trout fishing. (It is also one of the worlds largest snow making ponds since the Killington Resort received permission to pump water from the pond for winter snow making.) From the reservoir, proceed down hill to the junction of Rt. 100 and Rt. 100A in Plymouth Union Vermont. Turning left onto Route 100A in Plymouth Union, the road sweeps steeply upward over Salt Ash Hill. You are now entering the Plymouth Notch Historic District, where Calvin Coolidge lived. Salt Ash Hill is the steepest hill climb on this bike loop. It is a very steep hill climb of several hundred feet over a short distance. Many bikers need to stop and walk their bikes up Salt Ash, so don't be embarrassed if you need to trade pedals for a quick walk. At the top of Salt Ash Hill, the terrain turns into rolling Vermont countryside dominated by stands of trees and open farm pastures. While here, visit the Coolidge Birth Place. At the Coolidge Welcome Center you can get tickets and a clear, self guided pictorial tour of Coolidge's history. Coolidge's birthplace and house where he was raised are still intact, as is the tiny space above Cilley's store, which served as the summer White House during Coolidge's term as president. Leaving the Coolidge Birth Place, Rt. 100A climbs gently and passes the Calvin Coolidge State Forest. The access road through the forest is paved, but quite steep in places, if you are interested in another side trip. Passing the State Forest, Rt. 100A slopes down hill towards US Route 4 at Bridgewater Corners. At the corner of Rt. 100A and Rt. 4 you will find a country store. This is a good spot for some refreshment. Alternatively, you can continue on, taking a left turn onto Rt. 4. Approximately 1/2 a mile on the left, you will encounter the Long Trail Ale Brewery. You can taste the beer and take a brewery tour. Tours are usually conducted from noon to 5 PM. The brewery also features an onset pub, which includes a collection of Long Trail's micro-brewed ales on tap. They also have a nice pub lunch which can be taken on the deck out back overlooking the Ottauquechee River. From the Long Trail Brewery, you have approximately 5 1/2 miles to go on Rt. 4 to get back to the starting point at Rt. 100. Route 4 is a very winding mountain road traveling through the Ottauquechee River Valley. The road surface has a wide "breakdown" lane which provides a comfortable space for bicycles. However, use caution when going over the 2 lane bridges which span the Ottauquechee. The breakdown lane is not available on the bridges, and on occasion Rt. 4 does have some traffic. When you arrive back at Route 100, take a left back to the starting point. You have traveled approximately 18 miles through some very diverse Vermont Countryside.